January is the time of year to look to the past and plan for your marketing future. 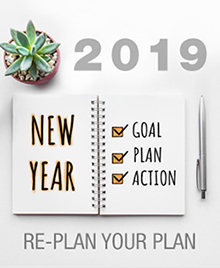 Listing the successes and failures of 2018 can help you make effective goals for 2019. First, define your target client. Think back on the clients you worked with in 2018—list their age range, educational background, income level, occupation, and interests. Knowing your average client will help you know where to market to attract more clients who want and need your services. Second, recognize that the purpose of marketing is to keep your name top of mind when consumers are seeking a lawyer. Finally, create a marketing plan around activities you enjoy. If you like to write, increase your number of blog posts and articles; however, if you enjoy face-to-face activities, volunteer with organizations that complement your practice. When looking at your marketing plan, it is helpful to know what the marketing experts think will be the new trends, and here is what they foresee for 2019. Website—Update your profile, be sure your website is mobile friendly and will load on any platform, and be sure the content is informative and current. Podcast—Podcasting is exploding as a media source. Launching a podcast for your target audience can keep them informed and build your reputation in your niche market. Video—Video will continue to grow in 2019, and some predict that it will make up 80% of online traffic. Video can highlight your brand, mission, and unique values. Think of some webinars or webcasts that can educate clients on a legal topic. Publish a Book—There's no better way to establish your knowledge in an area of practice than to publish a book. You probably have all the copy you need from past blogs and articles. Once it’s organized and published, offer it as a gift to past clients, leave it in your lobby, and pass it out at speaking events. Voice Search—43 million people in the U.S. have smart speakers in their homes. Even more use voice search on their phones. Since voice search is usually in the form of a question (e.g. What is a trust? ), your content should include more questions to appear in a search. Get Your Team Involved—Your staff and service people who come into your office should know what type of law you practice and be able to recognize potential clients. They should also be able to briefly explain the services you offer clients. Consumers will continue to turn to legal directories to find their next attorney. Review your SBM member profile to make sure your information is current and complete. You can quickly and easily make your profile ready for the consumers of 2019.